Horses are becoming important mental health aids with equine therapy taking psychological treatment out of the clinic and into the paddock. Sharene Duncan, a mental health nurse, has a passion for horse-facilitated treatment and practices equine therapy from her property in Brisbane’s northern suburbs. A growing form of psychological treatment, Duncan believes equine therapy is helpful not only for animal-lovers but also as an alternative for those not comfortable with traditional counselling therapy. 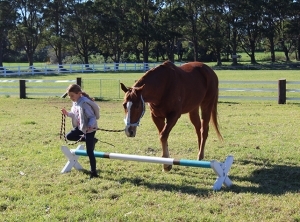 “People are attracted to equine therapy because it offers an experience with horses and not a lot of talking. Those with anxiety are particularly suited to equine therapy, according to Ms Duncan, as horses offer feedback in a non-judgemental and honest way and are highly sensitive animals. Equine-assisted therapy is also beneficial during the perinatal period through trauma-informed care, attachment, emotion regulation, mindfulness skills and increasing a woman’s awareness of herself and her relationship with her baby and partner, said Ms Duncan. “I have seen women prior to delivery with concerns about their emotional wellbeing and how this will impact their parenting, so we explore their experiences in childhood, attachment and trauma. “I have also seen women postpartum and have addressed anxiety relating to the stress of a newborn and psychosocial stress. Ms. Duncan said she plans to seek endorsement from the Australian College of Mental Health Nurses to run equine workshops for groups of clinicians aimed at increasing self-awareness, mindfulness and presence in both clinical practice and personal areas. “This can go toward professional development and credentialing for mental health nurses. “I also plan to offer equine therapy for clinical supervision. I feel that exploring clinical practice through experience with the horses would provide clinicians with the opportunity to examine their perceived sense of their experience. “As clinicians, we spend a lot of time in our heads and not with our sensory or embodied experiences,” said Ms Duncan. Meg Kirby, founder of the Equine Psychotherapy Institute, the first of its kind in Australia, runs training and certification programs for practitioners to incorporate equine assisted psychotherapy into their practices. It’s crucial that equine assisted psychotherapy be facilitated by a registered mental health practitioner who has undertaken extensive practitioner training and supervision, said Ms Kirby. “There is equine therapy, and there is equine assisted psychotherapy. Anyone can say they offer equine therapy, call themselves a therapist, and yet be untrained, unqualified and unregistered as a mental health practitioner – sadly, you find this everywhere – horsemen and women who offer ‘equine therapy’. “It’s important the community understand that equine assisted psychotherapy must be provided by a qualified mental health professional, such as a registered counsellor, psychotherapist, social worker, psychologist, or psychiatrist. “Even though the community loves horses, it is not just the horses' presence that creates safe, professional and effective support for clients with anxiety and depression. “It is the well-trained, experienced mental health professional who is partnering with horses to offer these innovative services,” said Ms Kirby. After witnessing the positive effects horses have on mental health, Psychologist Samantha Tassini was determined to create a space where horses and humans could work together to learn, grow and heal. It was this vision that led Tassini to start Heal Psychology on a property surrounded by the natural rainforest and coastlines of Wombarra in News South Wales. Ms Tassini said her clients arrive at a paddock with horses, but she still integrates cognitive behavioural therapy and evidence-based therapies into the model of equine-assisted psychotherapy to address mental health and life issues. Horses are prey animals, said Ms Tassini, so they flee from danger, which means they are also highly sensitive and rely heavily on their senses for survival. As a result, the horse can provide immediate feedback about how we are feeling, said Ms Tassini. Research has found promising results in the use of equine assisted psychotherapy, said Ms Tassini, including a reduction in depression, psychological stress, and anxiety, as well as an increase in general wellbeing and self-esteem. Dr Heather Fraser, Associate Professor in Social Sciences, said she wasn’t sure what to expect from equine therapy when she first met with Ms Duncan. “I wasn’t clear about what I was hoping to get from the process and with no previous experience with horses, I had little idea whether they would like me. “Much of what motivated me to attend was the idea of doing something different and seeing whether I could develop insights while in the mesmerising company of horses, and in their territory." Ms Fraser said the beauty of the landscape, perfect weather and the magnificence of horses added to her positive experience but it was a cheeky jack russell named Charley and a woman in county clothes with a no-nonsense but kind and gentle demeanour that made her comfortable. At first, Ms Fraser said she probably tried too hard to integrate with the horses and when one tried to dominate her - albeit gently - she didn’t know how to respond. “Months went by, and a few more long sessions unfolded. I stopped seeing the horses as huge, gigantic and enormously powerful animals and started to see them for their intelligence, sensitivity and authenticity. “Engaging with a young horse in the presence of his mother and the other horses in the herd gave me a sense of belonging not captured by words. Being allowed to groom them, that is, them letting me do so, made me feel special. “Sometimes it feels like their large eyes can see into my soul. Without judgement or scorn, they simply reflect back to me snapshots of who I am. “I am lucky to have such a kind and quietly protective human therapist ushering me through this process. Without her involvement, I’m not sure I’d have made the same connections to the horses and in turn, my own experiences. “As someone prone to anger and frustration, I like being motivated to explore other emotions in the horses' presence instead. “I am motivated not to rehearse old grievances for fear of upsetting them. Ironically, I would have no such fear of upsetting a human therapist!